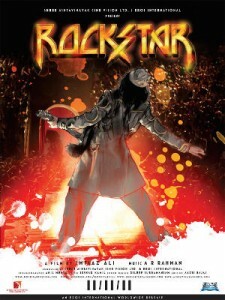 Rockstar is a young punjabi boy’s journey from being an unknown musician to becoming a Rockstar, who is a legend and inspiration to people across the world. Janardan Jakhar aka JJ(Ranbir Kapoor) whose deepest desire is to be one among the legends of music stumbles upon the idea that having his heart broken would give him the pain that would underline the beauty of his music. He meets Heer (Nargis Fakri), who is engaged; he pursues her in the hope of finding this pain. Despite his blunt approach to woo her, in what can be described as a hurried up attempt to not let the movie stagnate, the duo go from being awkward around each other to the best of chums. The scene stands out as possibly the weakest in the first half an hour of the film but dont worry there are a lot more to come. Before long the couple are the best of friends and running around town trying to do everything Heer wants before she is married. Yet on day of her marriage, Heer realizes her true feelings for Jordan(Ranbir’s new nick name) despite his ignorance about the same. She then heads to Prague to start her married life and Jordan returns to his old life sans his best friend. Then begins the story of the Rockstar. His journey thru suffering and adversity is possibly the finest part of the film. Told in a partial non linear narration, this part of the film is better than some of the best movies put together. Yet somehow the insistence of the writer to give more importance than required to the chemistry between the lead actors is what leads to the movie’s ultimate downfall. The story does well to capture the plight of fame of the star but the romantic angle always somehow ends up in screaming matches between the lead pair. The last half of Rockstar is honestly excruciatingly painful to watch. Despite the amazing music, lyrics, background score and Ranbir Kapoor‘s brilliant acting; you just want to run out of the theater by the end. Nargis Fakri’ beauty is inversely proportional to her acting skill and at times you wish someone slaps her for ruining some amazingly written scenes. Acting wise, the performance of Khamud Mishra as the canteen head and of Piyush Mishra as the head of the music company is just brilliant. Aditi Rao’s portrayal as a journalist and fan of Jordan is good in parts but seems very unnecessary to the whole plot at times. Imtiaz Ali‘s greatest strength is how well he knows his characters and that shows once again in Rockstar. His understanding of the psyche of Jordan and Heer is more than obvious with the clarity in the complex choices they make through out the movie. Its the yawning gap between his understanding of Heer and the portrayal by Nargis that unfortunately hurts the movie the most. This is easily Imtiaz Ail’s worst executed movie to date but considering the quality of his previous films(ignoring parts of Love Aaj Kal) he still is one of the most adventurous and exciting directors in India currently. Frankly I just hope he gets a better casting director for his next movie. Rockstar is a perfect example of how you can mess up a great story/script by bad decisions like casting and possibly writing parts of the screenplay when under the influence. In the end Imtiaz does succeed in making the audience wonder about the price of fame. If all the pain and suffering is worth standing in front of a crowd of worshipers, when all your thoughts are at that moment with someone else. The movie ends the way it starts but the scene now has a deeper meaning as we know what price had to be paid by him to be where he was. This entry was posted in Movies and tagged Film, Imtiaz Ali, india, Irshad Kamil, Love Aaj Kal, movie, Piyush Mishra, Ranbir Kapoor, Rockstar. Bookmark the permalink.